The November 10 workshop people checking out our winterized chicken tractors. 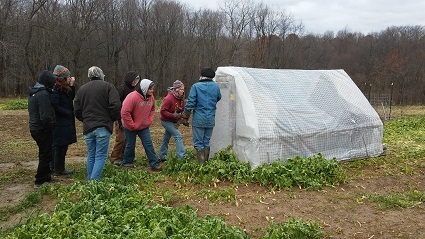 Covered with six mil plastic and deer netting, these portable pens become little green houses where chickens can stay warm all winter. The ground thaws underneath them and creates the illusion that spring is around the corner. Helps the hens lay in winter. Nice to get a visual on this.